Using the ESO 3.6-m telescope at La Silla (Chile), an international team of astronomers  has discovered a complex cosmic mirage in the southern constellation Crater (The Cup). This "gravitational lens" system consists of (at least) four images of the same quasar as well as a ring-shaped image of the galaxy in which the quasar reside - known as an "Einstein ring". The more nearby lensing galaxy that causes this intriguing optical illusion is also well visible. The team obtained spectra of these objects with the new EMMI camera mounted on the ESO 3.5-m New Technology Telescope (NTT), also at the La Silla observatory. They find that the lensed quasar  is located at a distance of 6,300 million light-years (its "redshift" is z = 0.66 ) while the lensing elliptical galaxy is rougly halfway between the quasar and us, at a distance of 3,500 million light-years (z = 0.3). The system has been designated RXS J1131-1231 - it is the closest gravitationally lensed quasar discovered so far. The physical principle behind a "gravitational lens" (also known as a "cosmic mirage") has been known since 1916 as a consequence of Albert Einstein's Theory of General Relativity. The gravitational field of a massive object curves the local geometry of the Universe, so light rays passing close to the object are bent (like a "straight line" on the surface of the Earth is necessarily curved because of the curvature of the Earth's surface). This effect was first observed by astronomers in 1919 during a total solar eclipse. Accurate positional measurements of stars seen in the dark sky near the eclipsed Sun indicated an apparent displacement in the direction opposite to the Sun, about as much as predicted by Einstein's theory. The effect is due to the gravitational attraction of the stellar photons when they pass near the Sun on their way to us. This was a direct confirmation of an entirely new phenomenon and it represented a milestone in physics. In the 1930's, astronomer Fritz Zwicky (1898 - 1974), of Swiss nationality and working at the Mount Wilson Observatory in California, realised that the same effect may also happen far out in space where galaxies and large galaxy clusters may be sufficiently compact and massive to bend the light from even more distant objects. However, it was only five decades later, in 1979, that his ideas were observationally confirmed when the first example of a cosmic mirage was discovered (as two images of the same distant quasar). Cosmic mirages are generally seen as multiple images of a single quasar , lensed by a galaxy located between the quasar and us. The number and the shape of the images of the quasar depends on the relative positions of the quasar, the lensing galaxy and us. Moreover, if the alignment were perfect, we would also see a ring-shaped image around the lensing object. Such "Einstein rings" are very rare, though, and have only been observed in a very few cases. Another particular interest of the gravitational lensing effect is that it may not only result in double or multiple images of the same object, but also that the brightness of these images increase significantly, just as it happens with an ordinary optical lens. Distant galaxies and galaxy clusters may thereby act as "natural telescopes" which allow us to observe more distant objects that would otherwise have been too faint to be detected with currently available astronomical telescopes. 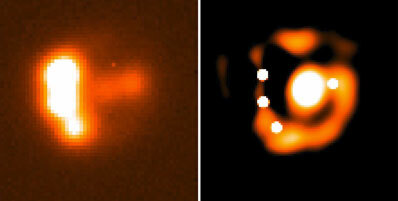 A new gravitational lens, designated RXS J1131-1231, was serendipitously discovered in May 2002 by Dominique Sluse, then a PhD student at ESO in Chile, while inspecting quasar images taken with the ESO 3.6-m telescope at the La Silla Observatory. The discovery of this system profited from the good observational conditions prevailing at the time of the observations. From a simple visual inspection of these images, Sluse provisionally concluded that the system had four star-like (the lensed quasar images) and one diffuse (the lensing galaxy) component. Because of the very small separation between the components, of the order of one arcsecond or less, and the unavoidable "blurring" effect caused by turbulence in the terrestrial atmosphere ("seeing"), the astronomers used sophisticated image-sharpening software to produce higher-resolution images on which precise brightness and positional measurements could then be performed. This so-called "deconvolution" technique makes it possible to visualize this complex system much better and, in particular, to confirm and render more conspicuous the associated Einstein ring. The team of astronomers  then used the ESO 3.5-m New Technology Telescope (NTT) at La Silla to obtain spectra of the individual image components of this lensing system. This is imperative because, like human fingerprints, the spectra allow unambiguous identification of the observed objects. Nevertheless, this is not an easy task because the different images of the cosmic mirage are located very close to each other in the sky and the best possible conditions are needed to obtain clean and well separated spectra. However, the excellent optical quality of the NTT combined with reasonably good seeing conditions (about 0.7 arcsecond) enabled the astronomers to detect the "spectral fingerprints" of both the source and the object acting as a lens. The evaluation of the spectra showed that the background source is a quasar with a redshift of z = 0.66 , corresponding to a distance of about 6,300 million light-years. The light from this quasar is lensed by a massive elliptical galaxy with a redshift z = 0.3, i.e. at a distance of 3,500 million light-years or about halfway between the quasar and us. It is the nearest gravitationally lensed quasar known to date. Because of the specific geometry of the lens and the position of the lensing galaxy, it is possible to show that the light from the extended galaxy in which the quasar is located should also be lensed and become visible as a ring-shaped image. That this is indeed the case is demonstrated in the above photo which clearly shows the presence of such an "Einstein ring", surrounding the image of the more nearby lensing galaxy. Micro lensing within macro lensing? The particular configuration of the individual lensed images observed in this system has enabled the astronomers to produce a detailed model of the system. From this, they can then make predictions about the relative brightness of the various lensed images. Somewhat unexpectedly, they found that the predicted brightnesses of the three brightest star-like images of the quasar are not in agreement with the observed ones - one of them turns out to be one magnitude (that is, a factor of 2.5) brighter than expected. This prediction does not call into question General Relativity but suggests that another effect is at work in this system. The hypothesis advanced by the team is that one of the images is subject to "microlensing". This effect is of the same nature as the cosmic mirage - multiple amplified images of the object are formed - but in this case, additional light-ray deflection is caused by a single star (or several stars) within the lensing galaxy. The result is that there are additional (unresolved) images of the quasar within one of the macro-lensed images. The outcome is an "over-amplification" of this particular image. Whether this is really so will soon be tested by means of new observations of this gravitational lens system with the ESO Very Large Telescope (VLT) at Paranal (Chile) and also with the Very Large Array (VLA) radio observatory in New Mexico (USA). Until now, 62 multiple-imaged quasars have been discovered, in most cases showing 2 or 4 images of the same quasar. The presence of elongated images of the quasar and, in particular, of ring-like images is often observed at radio wavelengths. However, this remains a rare phenomenon in the optical domain - only four such systems have been imaged by optical/infrared telecopes until now. The complex and comparatively bright system RXS J1131-1231 now discovered is a unique astrophysical laboratory. Its rare characteristics (e.g., brightness, presence of a ring-shaped image, small redshift, X-ray and radio emission, visible lens, ...) will now enable the astronomers to study the properties of the lensing galaxy, including its stellar content, structure and mass distribution in great detail, and to probe the source morphology. These studies will use new observations which are currently being obtained with the VLT at Paranal, with the VLA radio interferometer in New Mexico and with the Hubble Space Telescope. : The team consists of Dominique Sluse, Damien Hutsemekers, and Thodori Nakos (ESO and Institut d'Astrophysique et de Geophysique de l'Universite de Liege - IAGL), Jean-Fran=E7ois Claeskens, Frederic Courbin, Christophe Jean, and Jean Surdej (IAGL), Malvina Billeres (ESO), and Sergiy Khmil (Astronomical Observatory of Shevchentko University). : Quasars are particularly active galaxies, the centres of which emit prodigious amounts of energy and energetic particles. It is believed that they harbour a massive black hole at their centre and that the energy is produced when surrounding matter falls into this black hole. This type of object was first discovered in 1963 by the Dutch-American astronomer Maarten Schmidt at the Palomar Observatory (California, USA) and the name refers to their "star-like" appearance on the images obtained at that time. : In astronomy, the "redshift" denotes the fraction by which the lines in the spectrum of an object are shifted towards longer wavelengths. Since the redshift of a cosmological object increases with distance, the observed redshift of a remote galaxy also provides an estimate of its distance.